Is Influencing an Election "Political Science Malpractice"? So here's an important question: How badly designed and how many obvious laws do you have to break in your study before you stop and re-design it? And is the resulting effect on elections malpractice? This is not going to do anything for the perception that the northeast and the west coast don't care about the rest of the country: Stanford and Dartmouth political science researchers sent out 100,000 mailers to voters in Montana, trying to determine if voter turnout increased among those who received more information about candidates. So far, so good. Here's where things went awry: the mailers had the state seal on them and were titled "2014 Montana General Election Voter Information Guide," which most people would see as a state-sanctioned pamphlet. Stanford's spokesperson says they're investigating why on Earth the researchers thought impersonating the government was a necessary part of the study. I suspect that there is no answer that can be believed. Also, the researchers decided that the information included would be about how liberal or conservative they evaluated judicial candidates to be. Which is a giant problem for Montana, which has laws against identifying the political parties of judges. Oops. As you can imagine, Montana is pissed and Montana Secretary of State Linda McCulloch filed a complaint against the researchers. The complaint named violations of laws against "fraudulent contrivances" influencing votes a certain way, against misleading election information, against impersonating a public servant, and a requirement that groups engaging in political action register. Add to it that the study, funded by a $250,000 grant from the William and Flora Hewlett Foundation and $100,000 from Stanford, was approved by the Dartmouth Institutional Review Board and wasn't even approved by Stanford's, and you've got a political nightmare. On behalf of Stanford and Dartmouth universities, we sincerely apologize for the confusion and concern caused by an election mailer recently sent as part of an academic research study. 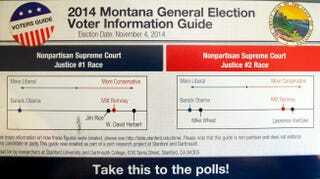 We genuinely regret that it was sent and we ask Montana voters to ignore the mailer. ... We are sorry that this mailer has been disconcerting and disruptive to many Montanans. We take very seriously our responsibility to conduct research and provide education that contributes to, but does not hinder, an informed citizenry. There are a lot of weasel words here. Apologizing for confusion and concern and being disconcerting and disruptive and not, you know, ignoring laws you could have googled — although if you need to google that using a state seal without permission might be a problem, I refuse to believe that you work at Dartmouth or Stanford. "It's basically political science malpractice. That's what I'd call it," Jennifer Lawless, professor of government at American University in Washington, D.C., told TPM. "When you're going to engage in an experiment as a political scientist, I think you have a responsibility not to affect election outcomes, let alone break the law." "When you can conduct an experiment in a real-world setting or amidst a campaign, it does add generalizability and real-world components to your results," she continued. "That said, there is a difference between trying to have generalizable results and playing electoral god." "This strikes me as a lapse in judgment. If the election's actually happening, they're intervening in it," Theda Skocpol, a political scientist at Harvard University, told TPM, though she cautioned that state authorities "ought to take a deep breath" before pursuing legal action. Jeffrey Tulis, associate professor of government at the University of Texas-Austin, told TPM in an email after being alerted to the study: "My initial reaction is that this quasi-experiment is improper and unethical." ... The political scientists calling this unethical don't seem to be quibbling about the use of the seal or adequacy of disclosure. It's the fact that an experiment could affect outcomes that they seem to question. ... You can also argue the finer points of informed consent in a democracy, but for me I think it really comes down to this question of whether academics can also be activists at the same time. Naturally I can come up with reasons why they shouldn't, but I don't find any particularly compelling. Most of us have political agendas, and we write books and articles pushing those agendas. It's not obvious to me that as an academic in a democracy I am not allowed to use my work to achieve certain political ends. I think it would be fair for universities to set out guidelines of appropriate behavior beyond what is required by law. And maybe disciplines and journals too. Personally I would prefer a university and discipline that restricted its members as little as possible. This seems to be a kind of political science observer effect: how can they test anything in the real world without affecting it? It seems that affecting elections, not out a passionate belief in the issues or even craven self-interest, but for cold research just rankles, for some reason. At least belief and self-interest aren't things that can randomly change things. So on the question of Dartmouth and Stanford: this was such a stupid mistake. But on the larger question of whether this is malpractice? Well, that's going to be a subject of debate for a while.